Bird ringers in Europe and bird banders in North America will both be familiar with the concept of a “bird observatory”. The concept even has an article in Wikipedia; no bird observatories in Africa are listed. That is the gap that the Biodiversity and Development Institute aims to fill. But for the time being, we are just going to talk about a long-term bird ringing site. 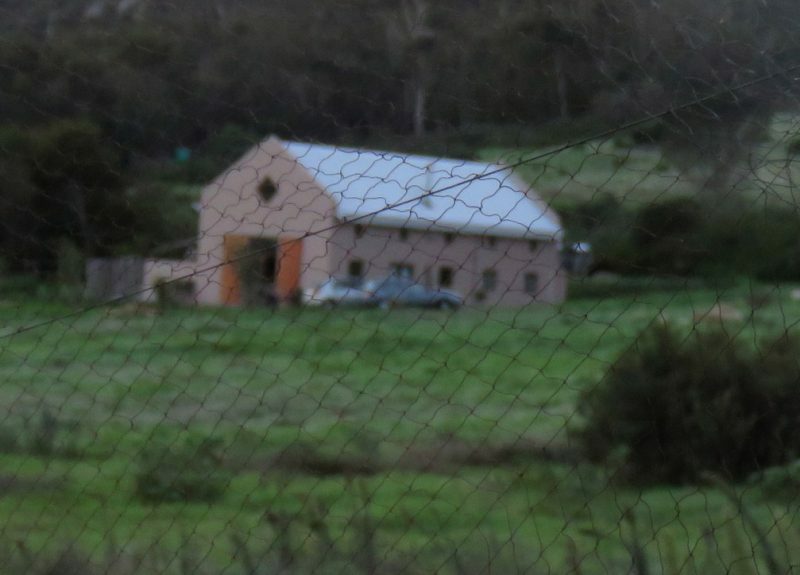 The BDI bird ringing site is on the farm Fynbos Estate, an hour’s drive north of Cape Town. This “cottage”, called Black Eagle, is the base for action. It is hardly a cottage (see below). It provides comfortable accommodation for up to 10 people. On the pioneer expedition in February 2019 we were a group of five bird ringers. 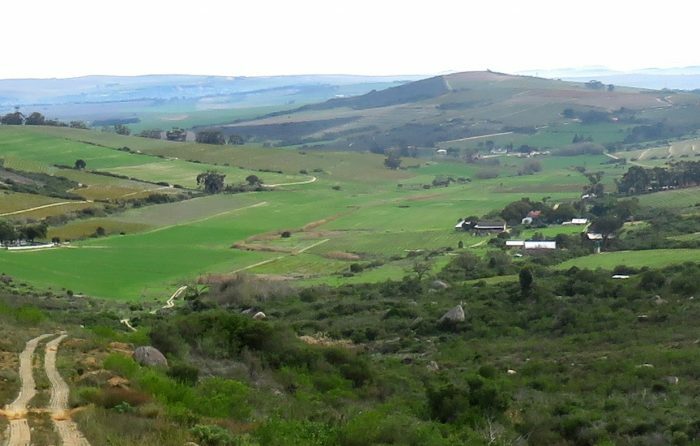 The setting is stunning, overlooking a valley of vineyards with a ridge of fynbos beyond. The pattern on the skyline above Black Eagle gives the mountain the name Dragon Ridge. 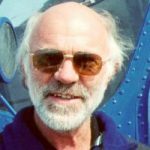 This first expedition established that the Black Eagle will provide superbly practical and comfortable accommodation for the BDI ringing expeditions. The front half is an enormous double-volume space which serves as kitchen, dining area, lounge and data-office. There are four bedrooms, each with two beds and three of them have en-suite bathrooms. One of the rooms can be turned into a dormitory with four beds. 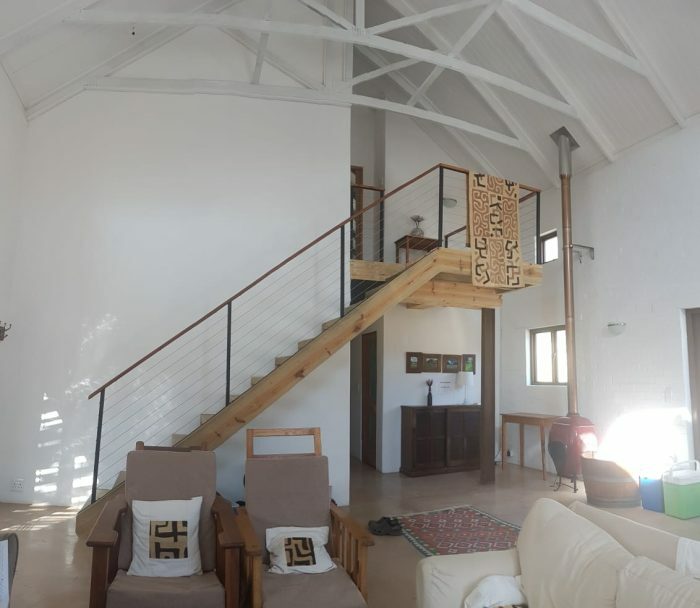 The accommodation is also eco-friendly – the electricity and the hot water are both solar (and there is lots of both!). 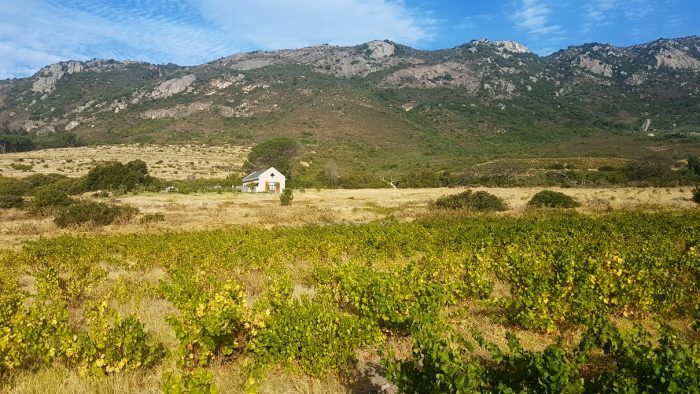 Fynbos Estate produces wines under the label Dragonridge. The winery is artisanal, and the wines are made using time-honoured methods that are too slow and risky for most modern winemakers. The sparkling wine is made using the same methods that French winemakers used in 1700, and the target date for other wines is to use the methods of 1900. This means no sulphur is used. 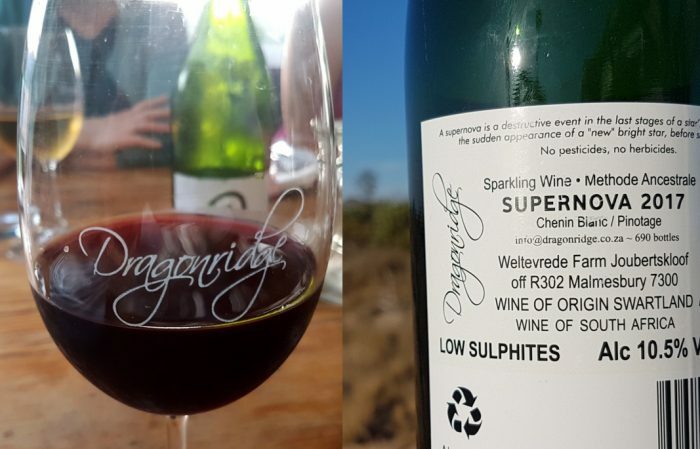 The sulphite content of the Dragonridge wines is below the limits of detection, but the authorities insist that there must be some, so label says “low sulphites”! 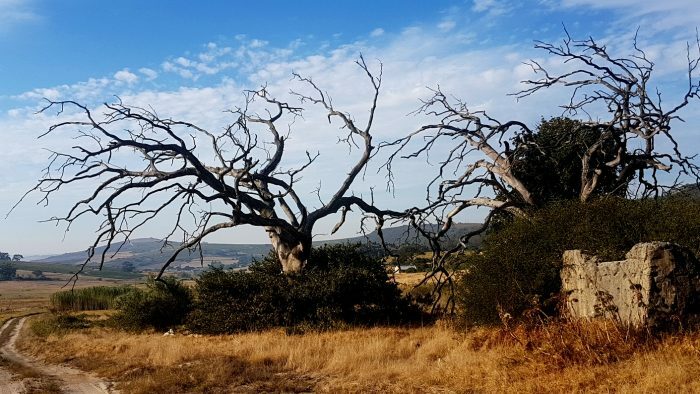 When they die, the skeletons of the old trees get left standing on Fynbos Estate. The trees decay slowly, develop cavities, and attract hole-nesting bird species, like woodpeckers and barbets. We have mistnetted Cardinal Woodpeckers and Acacia Pied Barbets here, and also Lesser Honeyguide, which is a brood parasite of the barbet. From the perspective of the bird ringer, there is massive plus at Fynbos Estate. There are lots and lots of distinct ringing sites, in a variety of habitats, and we have not yet found them all. Here is the BDI team scouting out a new site for the next morning, where they planned to mistnet a sample of weavers and bishops. The mistnets were erected, and then “furled” so they could not catch birds. They were opened early in the morning, at first light. The outcome. 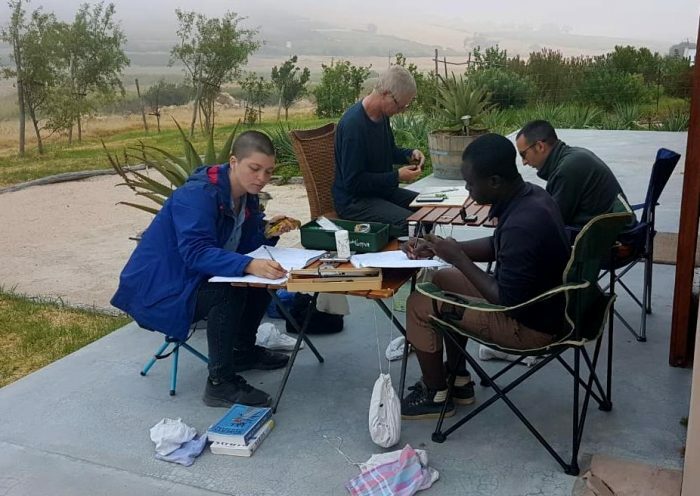 Four busy bird ringers on a misty morning at Fynbos Estate. 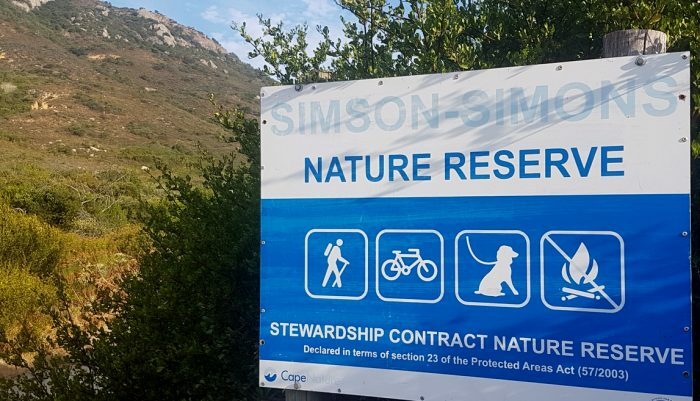 We don’t only ring at Fynbos Estate. During the pioneering expedition we teamed up twice with the ringers of the Tygerberg Ringing Group. On one of these joint events, we ringed at the confluence of the Diep and Mosselbank Rivers, on the farm Goedeontmoeting. We mistnetted excellent numbers of weavers and bishops, most of which were in moult. There were also four Malachite Kingfishers! Bird ringing has been undertaken on the farm Goedeontmoeting since the 1990s, so there is a track history of records stretching back nearly 30 years. The level of intensity has varied. Several of the birds mistnetted here were retraps, and had originally been caught during previous ringing sessions over the years. 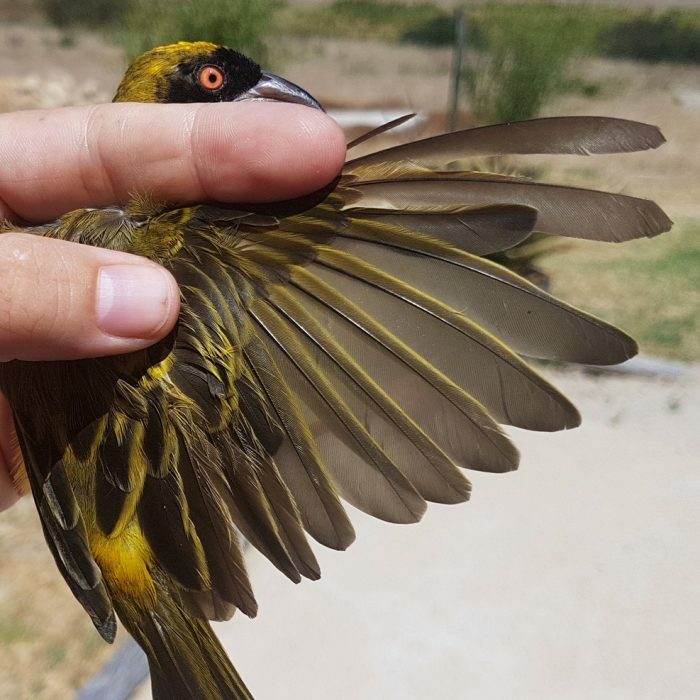 The oldest of these was a Southern Masked Weaver, which had been ringed by the Tygerberg Ringing Group on 28 July 2010, which is 3,129 days before the date of retrap, on 20 February 2019. That is 8.6 years. Once we have a hundred or more retraps for a species, we can use the data to fit models which estimate the annual survival rate. For a Southern Masked Weaver, surviving 8.6 years is exceptional. This illustrates the value of having long-term bird ringing sites. Note the arrival of celebratory cake! 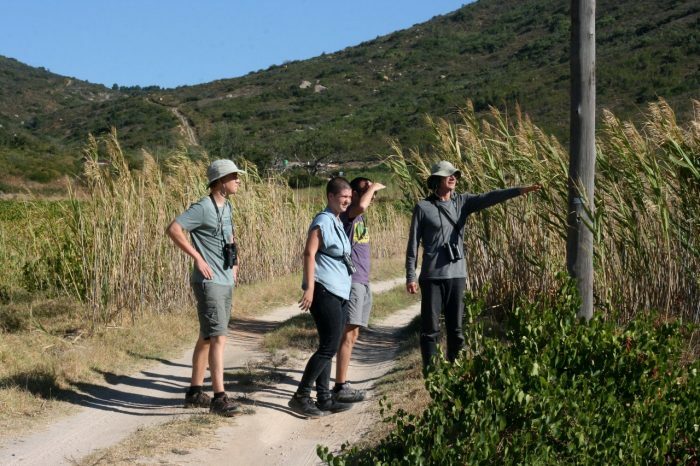 In total, the pioneering expedition processed a total of 375 birds of 27 species at Fynbos Estate itself. 136 birds were ringed at the two satellite ringing sites. We collected lots of valuable data on moult. This Southern Masked Weaver is a great example of a bird in quite an advanced stage of primary moult. Part 2 of this series describes eight of the 27 species ringed on this expedition. 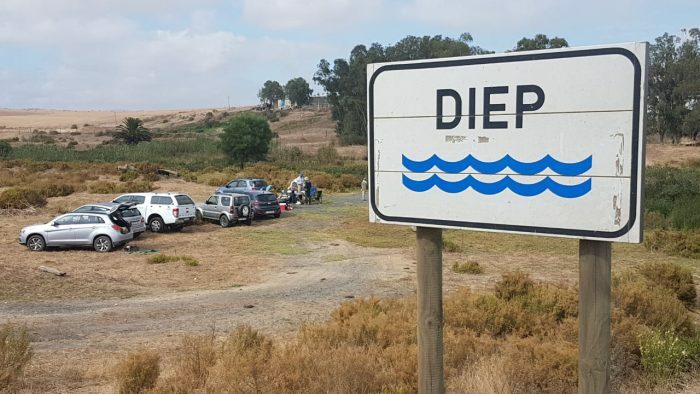 The nearest small wetland to Fynbos Estate is about 3 km away, a farm dam at Welgemeend. We observed 12 waterbird species. Egyptian Goose – 400 of them, and smaller numbers of South African Shelduck, Red-billed Teal, Yellow-billed Duck, Spur-winged Goose, African Sacred Ibis, Red-knobbed Coot, Little Grebe, Black-necked Grebe, Three-banded Plover, Blacksmith Lapwing and African Spoonbill. 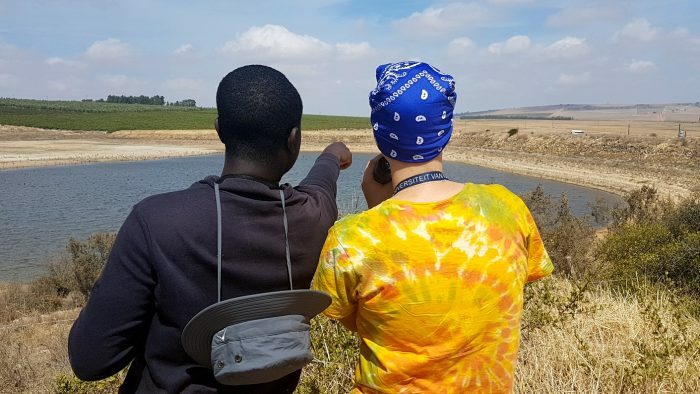 Details of how to get involved are on the website of the Biodiversity and Development Institute, in the section called African Ringing Expeditions. Help us achieve our dream of turning this first into a long-term bird ringing site and then into a bird observatory. In fact, this could become a biodiversity observatory. 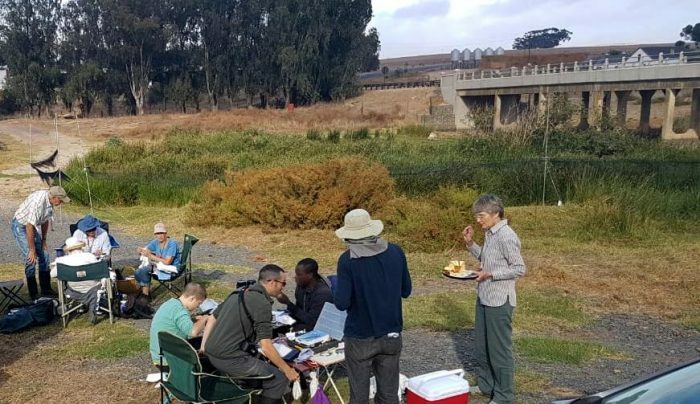 Become part of the history of bird ringing in South Africa. We will keep the Facebook page for the BDI African Ringing Expeditions up to date with news.